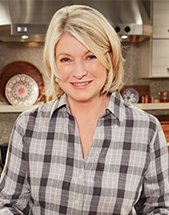 Martha Stewart, founder of Martha Stewart Living Omnimedia and Emmy® Award-winning television show host, entrepreneur and bestselling author, is America’s most trusted lifestyle expert and teacher. Millions of people rely on Martha Stewart as a source of useful “how-to” information and a guide for all aspects of everyday living — cooking, entertaining, gardening, home renovating, collecting, organizing, crafting, holidays, healthy living and pets. 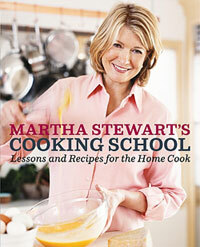 In May 2014, Martha Stewart's Cooking School won the James Beard Award for Outstanding Series, In-Studio or Location. MSLO’s expansive portfolio of television programming has been recognized over the years with 18 Emmy Awards including back-to-back Emmys for outstanding lifestyle show in 2010 and 2011. Martha's namesake company, Martha Stewart Living Omnimedia, founded in 1996, reaches approximately 100 million consumers across all media platforms each month and has a growing retail presence in thousands of retail locations. In addition, the company’s multimedia offerings encompass award-winning magazines, bestselling books, innovative websites and many digital apps. Raised in Nutley, New Jersey, in a family with six children, Martha developed her passion for cooking, gardening and homekeeping at an early age. Her mother taught her the basics of cooking, baking, canning, and sewing; her father introduced her to gardening at the age of three. Martha earned a bachelor’s degree in history and architectural history at Barnard College. Upon graduating, she became a stockbroker on Wall Street, where she gained her early business training. After moving to Westport, Connecticut, in 1972, she developed a catering business that showcased her remarkable talent and originality. Her unique visual presentation of food and the elegant recipes she created for her catered events were the basis for her first book, Entertaining, published in 1982. Entertaining was the first of 77 books, many of which are bestsellers, including Martha Stewart’s Baking Handbook, Martha Stewart’s Homekeeping Handbook and Martha Stewart’s Cooking School. The latter is the inspiration, Martha Stewart's Cooking School. MSLO also design high-quality Martha Stewart products in a range of lifestyle categories available through select retailers, including The Home Depot, Macy's, jcpenney, Staples (together with Avery), PetSmart, Michaels and Jo-Ann Fabric & Craft Stores. The MSLO family of brands also includes Chef Emeril Lagasse's media and merchandising propertoes.